What Business Are We In Again? When Diversification Leads To Disaster. As companies diversify, they often drift further from their founding purpose. The original brand strategies that made them distinctive, compelling, and drove their success become less and less connected to the companies they are trying to become. Unfortunately, when brands become unclear in the minds of their customers it spells trouble. Even more troubling is that they become unclear to the most important people of all, the ones tasked with delivering the brand experience to customers—the employees. What are the consequences of this lack of clarity? At best, it can lead to decreased sense of purpose, demise of corporate culture, lost sales, and ultimately a decline in profits. At worst, it can lead to outright business failure. Diversification is unavoidable for many companies, and in some cases it’s a necessity to remain competitive. When a company already dominates the market in their core business, and they have no other choice but to launch or acquire new businesses to drive growth, innovate, and fend off new competitors, then diversification is inevitable. However, most companies (yes perhaps even yours), do not fit this model and therefore, the best thing a company can do to put itself in a dominant market position is to specialize. Be known for doing “one thing” ridiculously well, rather than many things mediocrely. 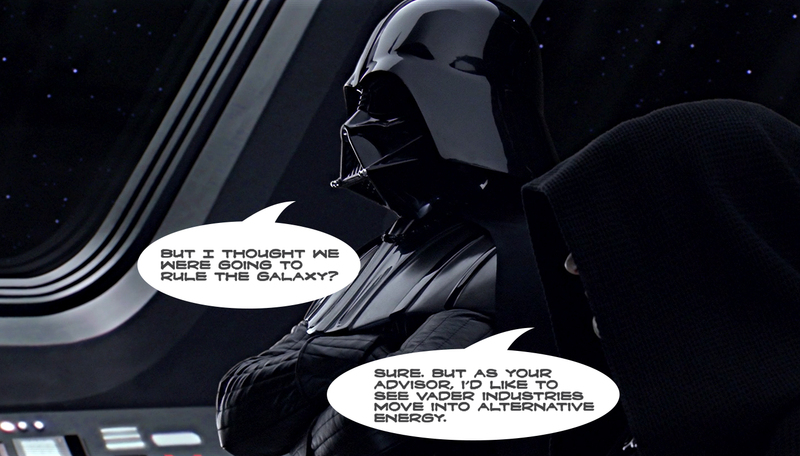 Darth Vader wouldn’t lead Vader Industries into the alternative energy space, even if he saw an opportunity to make some sweet coin. He would stay the course until his goal of destroying the rebels and ruling the galaxy was complete. Rather it is to say, you should aim to rule your galaxy. Otherwise, why be in business at all? There are a ton of things businesses do to dominate. Here are but three practices you can adopt into your business’ strategy. Embrace and socialize your company’s purpose. Know what it is that you do well, and always aim do it better than anyone else in your industry. Period. Use a consistent brand and naming architecture. It’s amazing how many companies out there strive to be forgettable. Clarity and consistency are key to communication. Make sure you use your name, descriptor, logo, tagline, and key messages consistently through all methods of your company’s corporate communications. Create a cohesive visual identity. You wouldn’t go on a first date wearing sweatpants with your new Boss jacket would you? The same holds true for your company in the corporate dating scene. Establishing a design system and guidelines for usage ensures your staff are always able to present the company in the best light, as it’s intended.